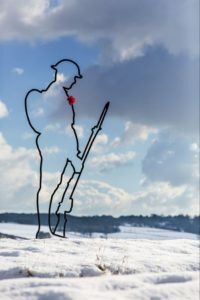 There But Not There, the First World War centenary campaign led by former Chief of the General Staff, General The Lord Dannatt, has launched a new series of educational resources to assist teaching today’s generation about one of the defining periods of the UK’s history. Developed in partnership with the Commonwealth War Graves Commission (CWGC), the range of resources will give pupils the opportunity to reflect on the impact of the First World War and to discover why remembrance has become a vital part of national life. Available to those aged 7 to 14, materials consist of lesson plans, worksheets and presentations, designed to educate about the level of sacrifice made by British and Commonwealth men and women in the First World War. The education resources will encourage the pupils to investigate the many backgrounds and experiences of the men, women and children who lived through the conflict. Created for groups covering Key Stage 2 and Key Stage 3 curricula in England, Northern Ireland, Scotland and Wales, the resources aim to challenge pupils to distinguish between methods of historical enquiry, make connections, draw contrasts and frame historically valid questions, while creating a wider knowledge of the First World War and how it affected communities across the UK and the Commonwealth. There But Not There Patron, Lord Dannatt said: “One of the key pillars of the There But Not There campaign is to educate. We believe it is vitally important that the generation of today are not only aware of the sacrifices made by so many men and woman during the First World War, but develop a strong understanding of the momentous effect it had on both the UK and the international community.